Parkland Movers – Do you feel overwhelmed with how much needs to be done even before you move? You’re not alone. Discount South Florida Movers has been helping people navigate the process for fifteen plus years. Our experts can help you plan exactly what needs to be done and then do the heavy lifting for you. Our mission is to leave you completely satisfied with your move and all for the lowest rates in town. One reason our customers love us so much is because we can help them with all aspects of their residential or commercial move. From securely packing your belongings to providing storage solutions, our experts can help you with anything you need from long distance shipping to moving pianos and artwork. If you are moving to or from anywhere in Florida or country, we can definitely help you. Parkland is a small city in the northwest corner of Broward County. This affluent city is home to 24,000 people and is boxed in by West Boca Raton to the north and the Everglades to the west. The city has gone to great lengths to maintain a park like style. This even including banning stoplights and stores until the early 2000s. This manicured city has won several accolades do to this park like environment. The Arbor Day Foundation has routinely named them a tree city and has also been designated a Playful City in 2016 by the KaBOOM! Foundation. Other attractions in the city are the Quigley park Tennis Center and the Parkland Recreation and Enrichment Center. 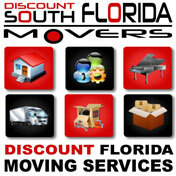 Discount South Florida and Parkland movers provide low rates on residential, commercial, piano and long distance moving.